M.A.X.-TECH Stealth Jet: When the M.A.X. 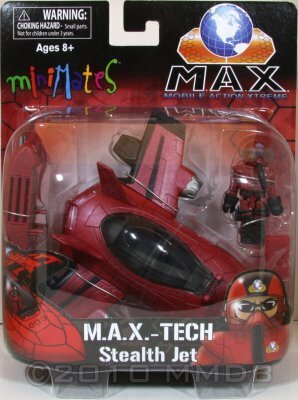 team needs to mobilize quickly, they take to the skies with the M.A.X.-Tech: Stealth Jet. Powered by the cutting edge Silent Turbine Engine Propulsion Hardware, (affectionately named "STEPH" by M.A.X. engineers), the Stealth Jet can reach speeds of well over Mach 3, while remaining whipser quiet. Armed with sonic air cannons capable of blasting obstacles without lethal intensity. When the action gets even more Xtreme, the Stealth Jet can be configured and combined with other machinery using the M.A.X.-trix (Mulitple Mission Alteration Xternal Matrix) socket drive to form a near endless variety of flight modes to tackle the mission at hand. From one-person hover-packs, to multi-wing configurations, to combining with other Stealth Jets to form dual-strike modes, you'll be ready to mobilize your team for action - to the MAX! Combine with other M.A.X. vehicles (sold seperately) to create multiple flight modes! Minimates can ride under the wing or you can use the parts to make a hover pack!